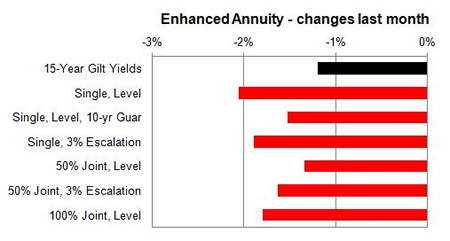 Annuities fall after economic fears send equity markets and 15-year gilt yields lower by 30 basis points before recovering and minimising the downturn however annuity providers have made greater decreases with their rates. The UK FTSE-100 index reduced 464 points to 6,388 after investor concern over economic growth in the US, Europe and other countries. Poor economic data from the US with falling demand started the sell-off in equities. Other news of Greece exiting their bailout programme, China's weaker than expected inflation data and Germany in economic slowdown all contributed to the falls. This sent the 15-year gilt yields 30 basis points lower for the month before recovering with a bounce back of less threatening economic news in the following weeks. Standard providers fell on average by 1.31% and we would expect to see an increase of 0.11% in the short term and in the medium term of 3 months annuity rates will decrease by 1.26%. Smoker and enhanced annuity providers decrease their rates by 1.75% on average with an increase of 0.55% possible in the short term and in the medium term of 3 months we can expect a decrease of 0.90%. Equity markets started at 6,622 and decreased by 76 points to end at 6,546. This represents a 1.1% fall and for people that remain invested will still see a fall in their annuity income with the combined fall in rates. 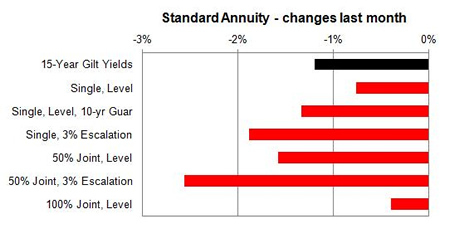 The majority of annuity rates decreased with only 6% rising, 2% remaining unchanged and 92% decreasing. Standard annuities have virtually all decreased with those aged 70 on a joint life basis falling by up to 5.4%. There were a number of increases for joint life annuities aged 55 to 60 of up to 4.6% but these were rare events. For enhanced and smoker rates all decreased during the month by up to 3.3%.Providers were more aggressive at decreasing their rates with an average of 1.75% exceeding the change in yields of 1.2%. 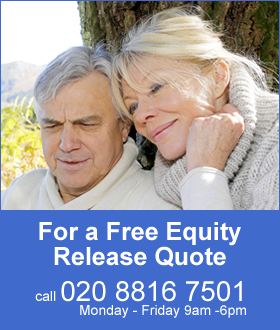 For the latest updates see Annuity Rates Review.